Howard Hewett making moves to his music as he wows crowd with, “I’m For Real.” The former lead singer of Shalamar performs at Salaam. Howard Hewett displayed his love of performing and interacting with the audience. The audience sang along with Howard Hewett to “Say Amen” while waving their hands to the music of this popular song. 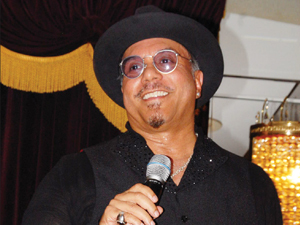 CHICAGO—Howard Hewett gave roughly 250 attendees a night to remember as he serenaded them with many of his popular songs during an intimate concert at Salaam Restaurant June 18. Before he started, the former lead vocalist of Shalamar thanked the Honorable Minister Louis Farrakhan and the promoters for inviting him to Chicago to perform at the beautiful Salaam Restaurant located in the Auburn Gresham community on Chicago’s Southside. Hewett, originally from Akron, Ohio displayed his love of performing and entertaining by interacting with the audience, taking requests, and going up and down the aisles to sing and dance with concert goers. As he sang such songs as “For the Lover in You,” the audience shouted with excitement and familiarity, often singing along. People from various age groups enjoyed the entire evening, which included a light menu of veggie wraps, bean soup, non-alcoholic specialty drinks and much more. With 16 albums recorded, countless collaborations and over 15 million records sold throughout the world, Hewett remains a viable force in the music business. Produced by Crescent Entertainment and laTee Entertainment, the event included a private meet and greet opportunity with Hewett. “I thoroughly enjoyed myself here at Salaam Restaurant. The ambiance was excellent,” said Tony Pierce. “It was a beautiful show, beautiful environment, and beautiful experience. I’ll definitely be back here for another show. Alderman David Moore was in attendance along with comedian Michael Coylar who gave an impromptu 10 minutes of hilarious standup comedy. The audience sang along as the R&B singer closed out with his 1988 hit, “Say Amen,” which praised Jesus. When Shalamar broke up in the mid-1980s, Hewett went on to a successful solo career. Hewett signed his solo deal with Elektra Records and in1986 released his first solo album, “I Commit To Love” (R&B number 12), a solid urban album that yielded two R&B hits, “I’m For Real” (R&B number 2) and “Stay” (R&B number 8). The album also included “Say Amen,” a gospel tune that became a surprise hit on the Gospel as well as Urban charts and is one of Hewett’s many signature songs. Comedian Michael Colyar gave an impromptu and hilarious performance. (Center) DJ Bro. Demetrius kept audience entertained with music. (R) Solo artist Bernard Lilly Jr. Was genuine and amazing.